Sushichat website sushichat.com is a site like chatroulette. When you enter, it shows Facebook pop-up and you have to like or wait 59 seconds. And after you enter, you can click "start chat" and start video chat on webcam. We don't suggest this chat website if you want to chat with girls for free. It' hard to find girls here and if you want to chat with men, this chat is a good place for you. Chatroulette US is a different website link to chat with people from USA. You can chat and search US people here. 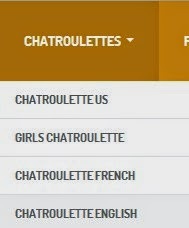 Girls Chatroulette is a special area to chat with girls, you must login here and pay $ to chat. You must Turn on Your Camera to chat here. However you must click to Start Search button, you can add any user to your contacts here also. Chatroulette French and English are another parts to chat; you may chat in English and French; it's video chat and you must allow your webcam to work to start chat here. You must like Sushichat on Facebook to start and enter chat. 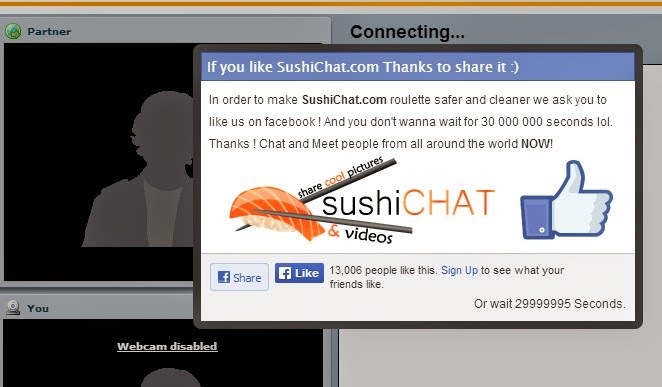 After you like, go to your Facebook account and search Sushichat; when you find it, "Unlike" it again and click to "Nofollow" to avoid any notifications from this website. Girls on Sushichat - Alternatives? It's hard to find girls here, you can try any of chat rooms it includes; you may try to Omegle, Bazoocam, Chatroulette and Tinychat to find more girls online. If you want to chat with adult people you can try also Cam4, Camzap and Flipchat etc.